As soon as I found out I was pregnant the books started piling up. Books I bought, books people gave to me, books from prenatal class, book from the Dr., magazines and more. I read til I was confused. And after Sadie was born I bought more books and had more given to me. I was glad to pass them down to my sister for her enjoyment. I still buy them and still enjoy them. 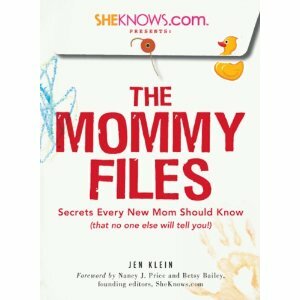 The Mommy Files is one of those books I really loved reading. It is written by Jen Klein. Jen is a mother of 3 children with a degree in art history and studio art and she writes technical documentation. Learning the act of mother hood along the way she has written a book based on her own lessons that she learnt. A down to earth book, with a chuckle because we know we have ALL been there. It’s like reading some great advice from a dear friend. Advice your mother can’t help you out with because the rules have changed since kids were allowed to travel in the back window of the car. She talks about pregnancy up til your child goes to their first day of school. Its all helpful advice and it makes you feel like your not alone in the world of motherhood. We all strive to be perfect but…have we met a mother that is absolutely perfect yet? I haven’t. The books retails for $12.95 US.